When students need a place to keep their books, backpacks and coats, school lockers get the job done right. It is important to provide personal storage lockers within the school environment so belongings don&apos;t need to be carried around all day. 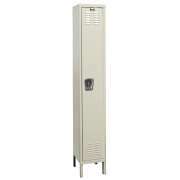 Metal lockers keep possessions secure while promoting organization. What kinds of school lockers can you get? 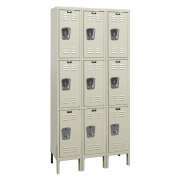 Hertz Furniture&apos;s selection of school lockers includes classic designs as well as specialized configurations. 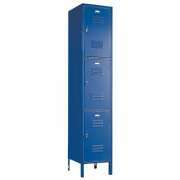 We have basic storage lockers as well as gym lockers and accessories. With such a great selection, you can easily outfit your hallways, locker room, teachers&apos; room and more. What should I do if I can&apos;t fit enough lockers in the hallway? Not all schools have enough room to give each student an individual full-length locker. However, just because you can&apos;t fit enough single-tier lockers in the space you have, doesn&apos;t mean you have to compromise on personal space. Instead of furnishing your school with large lockers, you can use double- or triple-tier lockers. Both of these alternatives still provide personal space without taking up as much room as larger options. Giving each student their own secure storage space helps protect everyone from property damage. In addition to an appropriate anti-bullying program, proper storage can be a great preventative measure when it comes to protecting students and their property. 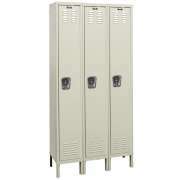 Double- and triple-tier lockers also work well in other parts of a school. You might want to consider installing some in the teachers&apos; lounge. This convenient addition will enable educators to store their personal belongings throughout the day, rather than having to carry them around. 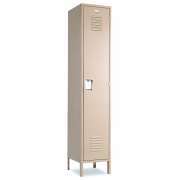 Ordering metal lockers for your employees will demonstrate that you care about their comfort and convenience. How can I prevent school lockers from smelling bad? 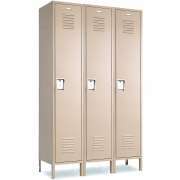 Make sure that the school lockers you purchase have louvered doors. Slotted openings on the top and bottom of the door provide ventilation without enabling anyone to reach in. Constant airflow diffuses smells and enables damp or wet outerwear to dry more easily. Why do schools need gym lockers? Gym lockers are an important component of physical education. In order to ensure that students come to PE properly dressed, it is a good idea to provide them with an appropriate place for gym clothes. Because they don&apos;t need to hold too many things, you can easily fit gym lockers in your locker rooms. With a personal place to keep their clothing, students are less likely to forget their sneakers or miss class due to lack of proper attire. If students are expected to get dressed for PE in the locker room, it is important to make sure that they have a comfortable place to do so. We have great locker room benches which provide the perfect space to sit down and get ready. With a well-organized and equipped space, less time will be wasted locating clothing and getting ready. Where should student athletes store all of their gear and equipment? 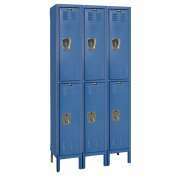 Any school that has sports teams, especially those that require bulky equipment, should consider investing in athletic lockers. Hockey and football players need a lot of large padding in order to stay properly protected, and it is important to make sure that they have a good place to store it so they won&apos;t forget anything. 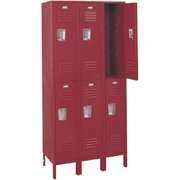 We have basic athletic lockers as well as enhanced models with lockboxes and footlockers. Lockers are about security as well as storage. It is great to have a place to put things, but it is even better if you know that your possessions will stay safe. When choosing school lockers, make sure to check which locking options they are capable of supporting. Some of our school lockers feature built-in combination locks. Alternatively, most lockers have a loop which is meant for a separate lock, so you can choose to provide either keyed locks or combination locks, or request that students obtain their own. School lockers keep your hallways neat and you students happy. Hertz Furniture&apos;s wide selection of metal lockers includes a number of great choices in sizes and colors that will fit well in a number of setups. Because ordering the right lockers can be quite a tricky process, we recommend that you contact the Hertz Design Center for free design and project-planning advice.